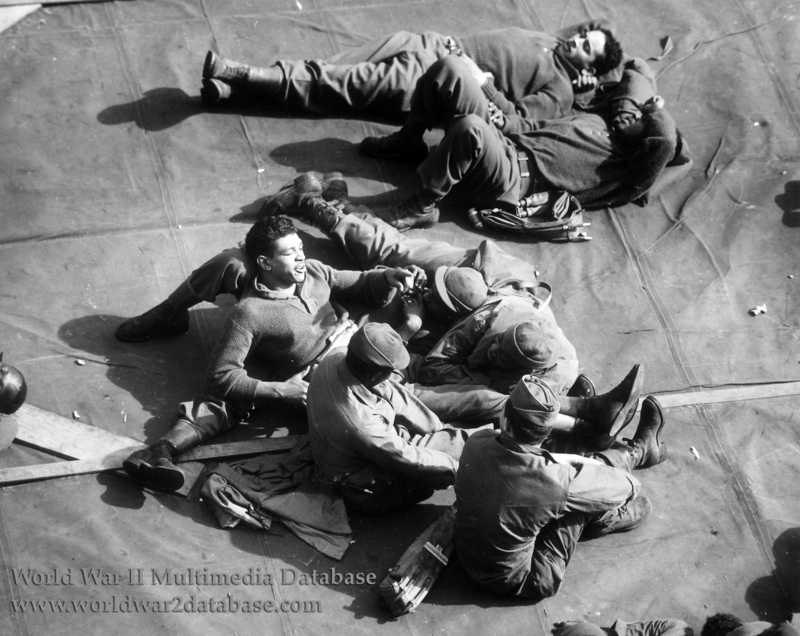 African-American soldiers of the United States Army relax on a hatch cover during their trans-Atlantic crossing to Europe aboard a Coast Guard troop transport. Note inflatable life belts in case of U-Boat attack. Over 20,000 African-Americans served in Europe and the Pacific, but the Army only had 4,500 Black officers by the end of the war. The United States Navy had thirteen by 1945. The United States Marine Corps failed the first three Blacks to attempt OCS; all three later graduated with advanced degrees in Law, Medicine, or Education, so many suspect they were the victim of racism. The first African-American Marine Officer was commissioned after the war ended. In transports to battlefields worldwide, African-Americans were segregated from white troops. Their bunks were deep within the hold, generally in the areas of the ship that was most prone to flooding in the event of a torpedo strike. They were generally given limited access to "topside" during the voyage, so this was probably a propaganda photo. At Army bases in the South, they endured cold rations outdoors while German and Italian prisoners of war were served hot food in local restaurants. The Mississippi Congressional Delegation demanded the Army keep all Black officers out of their state for the duration. Only the Coast Guard achieved full integration by the time of United States President Harry S Truman's 1947 order that desegregated the military. During the war, 965 African-Americans served as commissioned or non-commissioned officers in the Coast Guard; 5,000 African-Americans enlisted in the Coast Guard and served in many integrated crews. Coast Guard personnel crewed eighteen troop transports, ten attack transports, and nineteen freighters during World War II, in addition to hundreds of other ships and boats.